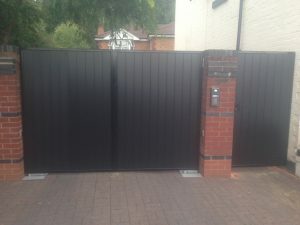 Job Specification – To supply and fit replacement driveway gates, pedestrian gate, automation system and intercom due to general wear/tear and age of existing gates and system. 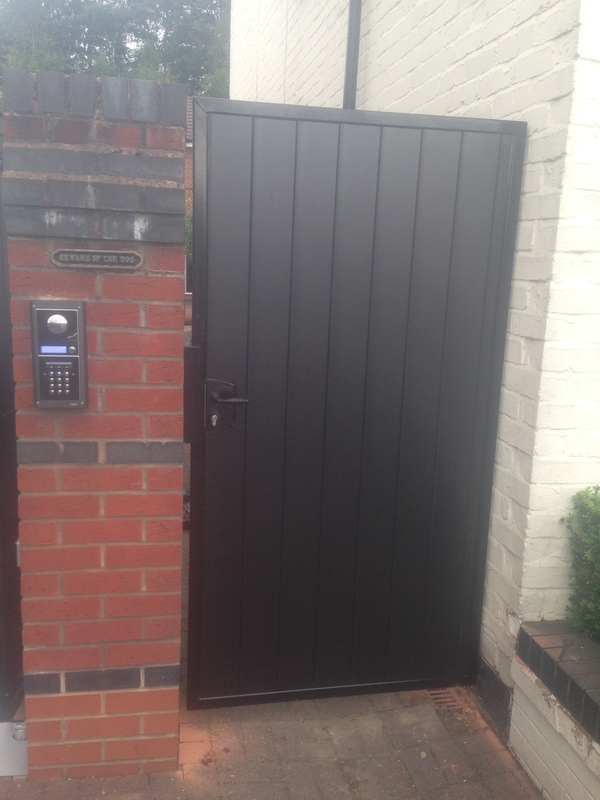 The customer initially requested a quote for aluminium gates but due to the cost, was unable to go ahead with our first quotation. We then provided a different option of a steel frame, with composite inserts in the same finish. 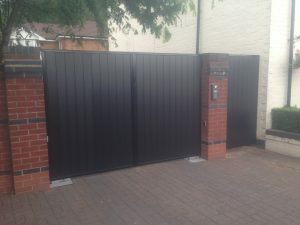 This enabled the customer to go ahead with their allocated budget and still obtain the style of gate they wanted. This method of manufacturing gates helps keep both costs and maintenance down to a minimum. The existing automation (over 15 years old) previously fitted by ourselves was then replaced for a new system for added reliability and ease of maintenance. The new system is now covered by a minimum of a two year warranty. Operating System– The customer can allow access to their property using the intercom system fitted, calling two handsets within the household – one in the kitchen area and one in the master bedroom. The gates can also be operated by remote control transmitters. Beautiful set of dark grey composite gates, manufactured within a steel frame for minimal maintenance. Swing gates operated using a Nice BM-4024 underground automation system, complying with all current British Standards set by Health & Safety. 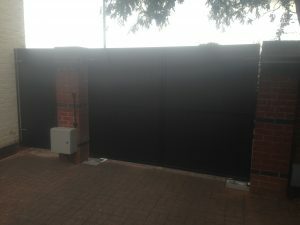 The 24 volt system has in built obstacle detection, meaning in the event of a person or vehicle making contact with the gates – they will STOP and reverse back within 0.75 seconds at a pressure of below 400 NM. In addition to the above, there is also a set of safety photocells across the opening to prevent the gates from closing onto a person or vehicle. 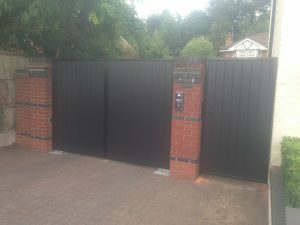 The pedestrian gate is secured using a standard handle and key lock. Access is controlled by the residents using remote control transmitters and a Videx Security Ltd DK4K-1S/CL intercom system. This model has a built in keypad module for added convenience.